Here’s a fun baking activity for your kids or for you kids at heart to make during the holidays. All you need are a few items you may already have in your pantry. I did make my own cupcakes from scratch, only because I was already making my Christmas cookies and had most the ingredients out anyway. But I did use store bought frosting. Either way is fine. The snowmen won’t complain. Prepare cupcakes as per cake mix directions and let cool completely. Spread a generous amount of frosting on top of the cupcake. Fill a small bowl with white, sparkling decorating sugar. Holding the bottom of the cupcake, gently press it down into the coarse sugar and rock it back and forth in all directions until the icing is completely covered. Take a regular sized butterscotch chip and gently press it into the center of the cupcake. Then use mini chocolate chips for the eyes and mouth. Aren’t they so cute?! How easy was that? While I was coming up with this recipe. I was getting a déjà vu feeling. Then I realized, I have made a similar cupcake recipe to this. Gosh, I must be getting forgetful. 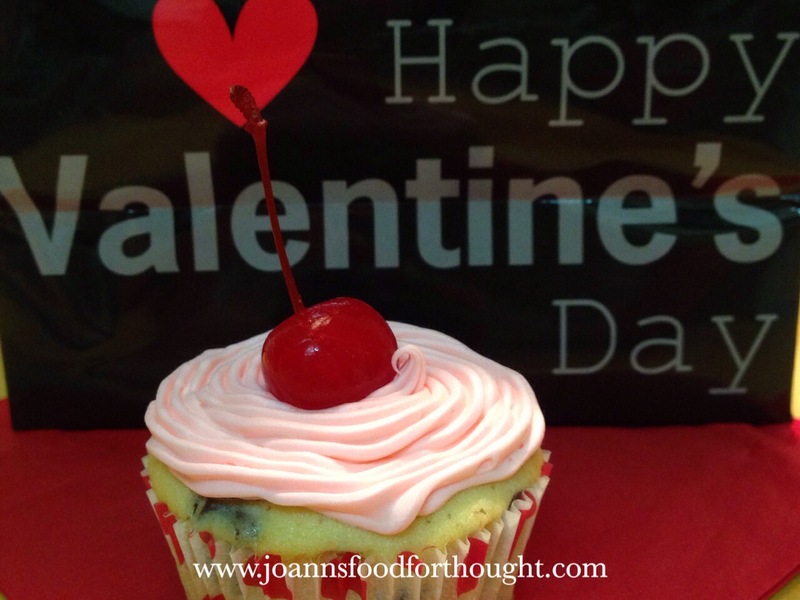 My Valentine’s Day cupcakes used similar cherry and chocolate flavors. 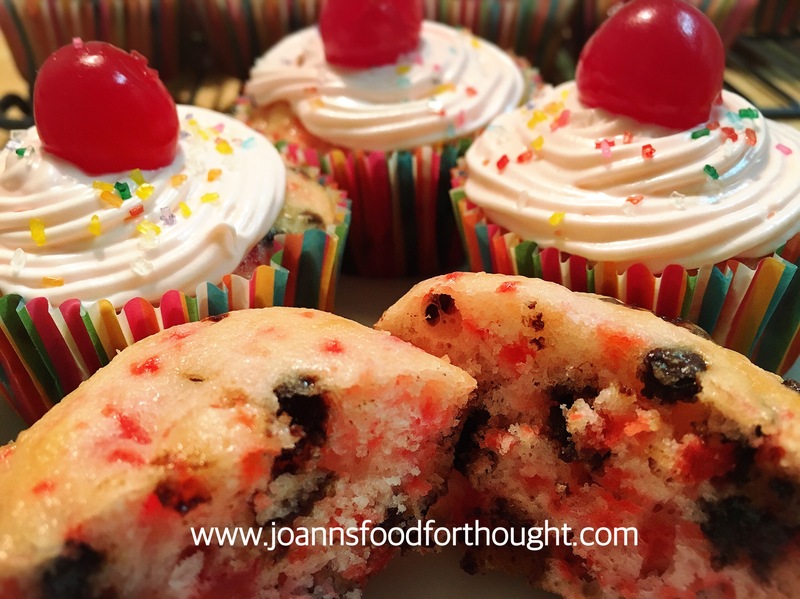 Check out that recipe here: Cherry Chocolate Chip Cupcakes. So I am calling these my Cherry Chocolate Chip Cupcakes 2.0 version. You can use a boxed white cake mix if you like. But this recipe is very simple, and you can have the bragging rights that you made these from scratch. This recipe makes 18-24 cupcakes. Heat oven to 350 degrees. Line 18 regular size baking cups in baking tins. Set aside. Finely chop cherries. Place chopped cherries in paper towel-lined bowl to drain while preparing batter. In a small bowl or container, add 1 tablespoon flour to 1 cup miniature chocolate chips and mix/shake well. Set aside. In a medium bowl, stir together flour, baking powder and salt. Set aside. In a large bowl, beat butter and sugar with an electric mixer on medium speed until well blended. Add 2 teaspoons almond extract to 1/4 cup whole milk. Beginning and ending with flour mixture, alternately add flour mixture and milk mixture to butter mixture, beating well after each addition. Fold in stiffly beaten egg whites. Fold in chopped cherries and miniature chocolate chips. Spoon batter into muffin cups, filling each about 3/4 full. Bake 20 to 25 minutes or until cupcakes spring back when lightly touched in center. 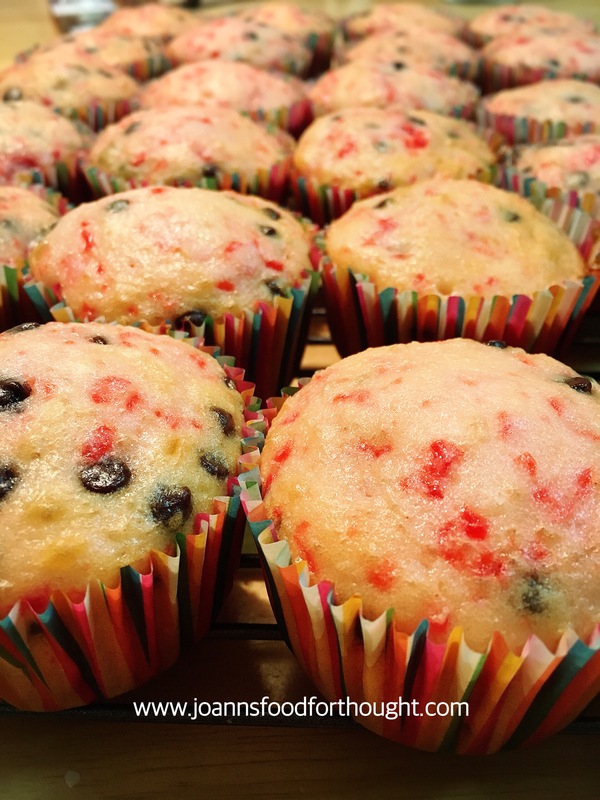 Remove from muffin cups to cooling rack. Cool completely, about an hour. To make Topping, spoon frosting into bowl with 1 tablespoon cherry liquid. Add 1 teaspoon cherry or almond extract; beat 2 minutes with electric mixer on medium speed. If desired, transfer topping to decorating bag fitted with large star tip; pipe topping onto cupcakes in large swirls. Or, spread topping on cupcakes with off-set spatula. 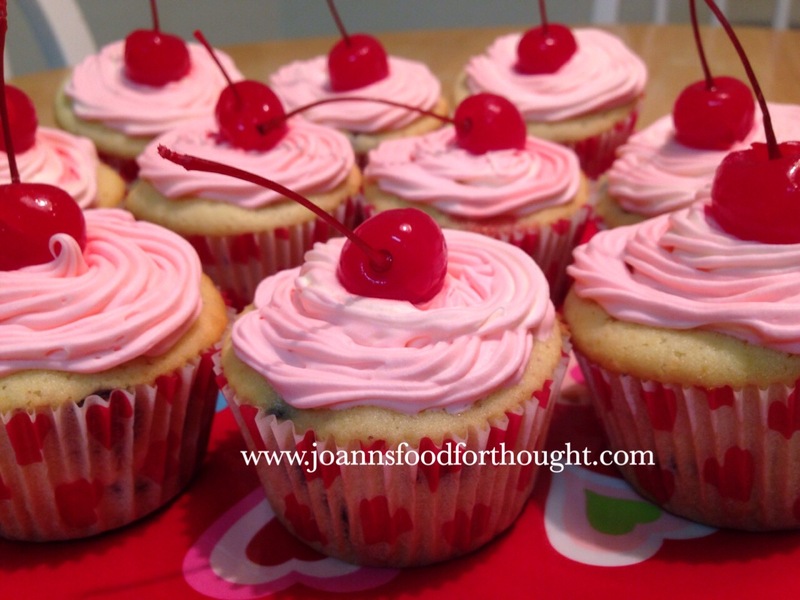 Garnish each cupcake with sugar sprinkles and a maraschino cherry. It’s almost Valentine’s Day. Need a special treat for your sweetie? Or maybe just a little treat for yourself? Sure you could just buy a box of cake mix, but nothing says love like a homemade baked good. Okay, we can cheat a little with the frosting. Go ahead and get your favorite vanilla frosting. I won’t tell. In fact, I’ll help you dress it up. This recipe makes 1 dozen standard size cupcakes. So, if you want to make more be sure to multiply ingredient quantities. Preheat oven to 350 degrees. Meanwhile line a cupcake pan with cupcake liners; set aside. With a spatula stir in the chocolate cherry chips. Place 3 tablespoons of batter into each cupcake liner. Bake for 20 minutes or until a toothpick inserted in the center comes out clean. Allow to cool completely before frosting. Add red gel food coloring to vanilla frosting one drop at a time, mixing until desired shade of pink is achieved. Add cherry extract and stir well. Frost cupcakes as you like. Optional add a maraschino cherry or other toppings for decoration.